Kennyz wrote: I'm sure grubstreet, diningdiva and their ilk will clarify soon. I got the ilk right. It was dish, which has given me enough info to be less than excited about this opening of Dos Diablos. Bakin' and Eggs - a new breakfast spot by the owners of Lovely Cafe is opened as of today. Based on Lovely's atmosphere, customer service and food, I can't wait to try it! cool - i saw that on urban daddy. looks good. Good quote on Q BBQ in that link as well; thanks. Chili's, Uncle Julio's, zag, etc. According to Superdawg's Facebook page, their new opening date for the Wheeling location will be sometime mid-December. They said there's been a lot of changes to the design over the past few months that have delayed things. Me too. So did Helen over at GrubStreet, apparently. Buffalo wild wings in Evanston will be open this Sunday. Mount Prospect Journal wrote: Another sandwich shop is expected to move in but a lease has not been signed so Conroy could not comment any further on who it will be. "It's something similar to Five Guys," said Conroy. "Very popular in other parts of the country, but not well-known in the Chicago area." Care to speculate? Chick-Fil-A perhaps? My guess is Jersey Mike's- there's currently locations in Vernon Hills, Naperville and Gurnee. And apparently there's another 900 sq ft left for another place. There is YET another Subway opening in Evanston--this one at Emerson and Ridge, in the same group of shops as Ruby of Siam. Panther in the Den wrote: At the old White Hen Pantry space on Lake St just east of Thatcher Ave.
That's interesting. The people at the White Hen on Howard in Skokie told me that White Hen is now owned by 7-11, and former WH franchisees apparently have some sort of out-clause. They were in the process of going independent as of a month ago. Maybe the same thing at Frank's. Kennyz wrote: Start the "What do Caucasians from Scottsdale or Bortz Entertainment Group have to teach Chicagoans about Mexican food?" conversation now. Dos Diablos is (are?) throwing its (their?) hat(s?) into the exploding upscale Mexican ring in River North. 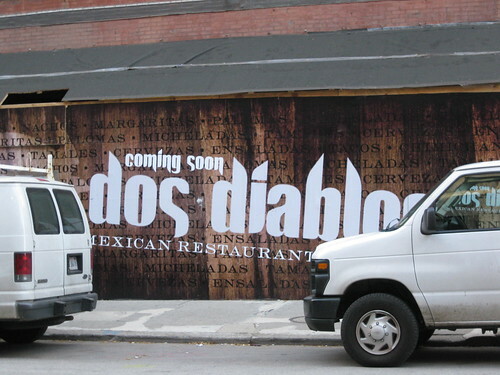 Interestingly, Metromix says the restaurant is owned by Chicago's Bortz group, but Dos Diablos is (are?) an upscale Mexican restaurant in Scottsdale with virtually identical signage, and I don't think Bortz is involved in that. I'm sure grubstreet, diningdiva and their ilk will clarify soon. Dos Diablos in Scottsdale is not bad (especially for getting a quick table during Spring Training)- to speak in Chicago terms, it's sort of a Fuego Loco - De Cero mashup, not particularly New Mexican. The spit roasted chicken was tasty - hope it makes the menu here. For so many reasons, I can't believe I'm reporting this, but... according to a Tweet from the dining diva woman, Geno Bahena will be in charge of the kitchen at dos diablos. I am sitting in a bar by myself, typing on a laptop while waiting for my car to be finished at the shop, and I can't stop chuckling. Poor waitress looks concerned. Vong's Thai Kitchen on Hubbard Street will be closing at the end of December, after ten years of operation. No idea what will be going on with that space after that. After today, Lunch Rolls in the loop will be no more. Unfortunate, considering the limited number of decent lunch spots in the loop to begin with. The cashier told me that they should be reopening in January, however, with a new concept. nshef wrote: After today, Lunch Rolls in the loop will be no more. Unfortunate, considering the limited number of decent lunch spots in the loop to begin with. As much as I love Lunch Rolls, their business looked to be way off lately so this doesn't come as a complete surprise. Agreed, especially the past week or so. Yesterday was practically dead. I just chalked that up to it being Thanksgiving week, but unfortunately there was more to it than that. I'm really bummed about that, since I work literally across the street, and it was always (well, for its fairly brief tenure) a solid option. I finally found T O'D @ at the old ice cream palace in RV. He's the one who grabbed the kaze fryer. He's also got a killer (um, in a good way) gelato machine. The place is small but should be aok when he has the time to put it all together--the vehicle crawling into his window certainly doesn't help much--apparently also took out four street cars! In other hood news the place a couple of blocks down and north reports they should be up and going in a week or two. I forgive, but have no, none, nada, idea what you are trying to convey. Zero, not place, person, type of food, nothing. A pretty much total waste of bandwidth. Spoke to someone at Kaze who told me they're just closed for repairs through mid-to-late October. 1. Kaze is most likely not re-opening. They sold their deep fryer to the guy down the street (I'm guessing the guy mentioned above with sandwiches and charcuterie). 2. If Kaze is to reopen it most-likely will be with a different chef. 3. Costello's has been sold recently, nothing known about the new owners. Chris Costello sold both locations. There's still no sign of life at the ice cream parlor. Does anyone have an update on that? How about an estimated opening date for the charcuteria? Olde School wrote: Driving by Sak's Ukranian Village Restaurant during the past week, things look dark and shuttered. No answer when I called today. According to Metromix, Sak's will be replaced by Mr. Brown's Lounge, a Jamaican restaurant/bar. Vitesse98 wrote: Good as they were with kids, I won't miss Great Harvest, not least because they were the ones that aggressively lobbied to keep Red Hen out of the farmer's market (even though that was Oak Park's sole option for crusty bread, save Whole Foods). That Red Hen is opening a store is awesome news, and beats buying their imported loaves from the Cheese Market. Now all Oak Park needs is a quality cake bakery and we're golden on the carb front. Opening down the street, just half a block south from Nola's Cup: a sushi bar (!?). In south Oak Park, in a cursed strip of vacant storefronts. They've spent a lot of time spiffing up the exterior, and it's great that something like this is coming to south Oak Park, so I have my fingers crossed if not my hopes up that this will spark some renewed activity (I know Pan's is finally adding a parking lot, too, and they've made a small effort to expand their selection). Still, how funny will it be to have both a Brazilian place and a sushi (or perhaps pan-Asian? we'll see) place in the no man's land that is my immediate 'hood? Looks nice from the outside! George's What's Cooking in Deerfield - "temporarily closed" due to tax problems with the IL Dept. of Revenue. A sign on the front of GNR Healthy Food states that after 50 years of service, they will be closing for good on December 15, 2009. A chat with our waitress Sofia revealed that they have been open since 1938 and the owner is taking her much-deserved retirement. This was our first and unfortunately probably will be our last meal there, but all good things must come to an end. Get there while you can for some great homestyle Lithuanian food. geno55 wrote: A sign on the front of GNR Healthy Food states that after 50 years of service, they will be closing for good on December 15, 2009. A chat with our waitress Sofia revealed that they have been open since 1938 and the owner is taking her much-deserved retirement. This was our first and unfortunately probably will be our last meal there, but all good things must come to an end. Get there while you can for some great homestyle Lithuanian food. no!!!! the restaurant where my mother went into labor with me in 1981, and one of the best old-school holdouts in bridgeport. i'm glad they were around for as long as they were, and hopefully they'll be selling off some of their one-of-a-kind decorations. think there's any chance of her bacon bun recipe going public? ... Healthy Food Lithuanian Restaurant has been relegated to second fiddle. HF is more along the lines of a diner and GD is a solid restaurant with a full service bar. It is always sad to see an ethnic restaurant (on a short list of this type) close and I will have to get out there for a final meal. I am not surprised though as the area has been going through a strong gentrification and when ever I visited there wasn't much business. Oculi wrote: no!!!! the restaurant where my mother went into labor with me in 1981, and one of the best old-school holdouts in Bridgeport. I'm glad they were around for as long as they were, and hopefully they'll be selling off some of their one-of-a-kind decorations. think there's any chance of her bacon bun recipe going public? The bacon buns (Lasineciai) are not that difficult. My Swedish mother, providing for my Lithuanian father, has a simplified recipe. She would buy some Pillsbury dough (in the tube) spread out strips, brush with butter and fill with fried bacon pieces. Roll, brush with some more butter and bake. Does anyone know when the new Epic Burger on North is going to open? boshow48111 wrote: Does anyone know when the new Epic Burger on North is going to open? Wally & Agador's (Lakeview) has closed. boo, they had some of the best sandwiches and sides, especially in that neighborhood.